Val Bodak, Principal, recently wrote a review of our book for the Ontario Principal’s Council publication, The Registrar. Click on the image below to read the review. Thanks Val! 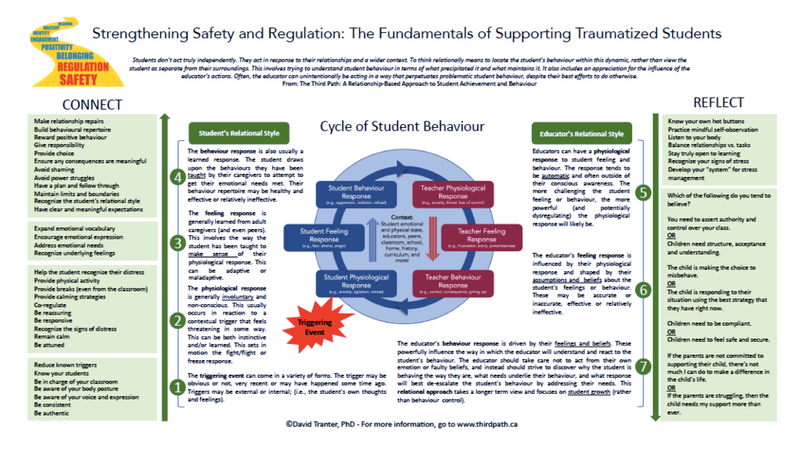 You can download the one-page resource HERE. It’s best printed out in 11”x17”. Defiance usually involves impulsive behaviour, pushing back against rules that seem unfair, or testing boundaries and the power of authority figures. Opposition involves trying to control others and one’s environment. It often stems from living in a home that feels out of control. Cognitive and behavioural rigidity involves difficulty shifting thinking and behaviour from one situation to another. This can be most typical of students on the Autism Spectrum. The goal is to change the way the student relates to others from one that is characterized by conflict, chaos and emotional intensity, to one in which they can share the stage with others, remain under control emotionally, and problem-solve in a successful manner. It’s often about lowering the emotional intensity of relationships. 1. Don’t feed the beast! Remain calm. Do not get caught up in escalating the situation. This is often how the student is expecting you to respond. You are entering into their world when you take the bait and let your emotions get the better of you. 2. Choose your battles. Try not to feel the need to correct every infraction. You’ll get drawn into reinforcing the student’s behaviour by getting into a special (and probably dysfunctional) relationship with them. 3. Walk don’t always talk. Avoid giving long lectures, getting caught up in arguments and negotiations, or being sarcastic as a way of asserting your authority. Instead, quietly and clearly follow through with expectations. 4. Use language of connection, rather than confrontation. Try to avoid language that will draw the student into a power struggle. Saying things like: “What are you doing?”, or “Stop doing that!” will invite opposition. Instead, stay calm and tell the student “what to do”, rather than “what not to do”. Say, “Why don’t you try to finish your math”, rather than “Stop bugging your neighbour”. 5. Guess what controlling kids need? Control. So, give them some control. Taking control away entirely from oppositional students will create a great deal of anxiety for them. Try to give them choices in advance, rather than negotiating in the moment. For example, let them choose among a few different activities. 6. Provide the student with a clear (preferably visual) schedule of their day. The student will be more able to cope with the events—and especially the transitions—of the day if they start it by seeing their schedule. This provides them with a sense of control, and helps them to emotionally prepare, rather than react, to change throughout the day. 7. Provide the student notice prior to each transition. Give the student a few minutes warning between activity changes, especially significant ones like changing classrooms, going outside, or changing teachers. a. Take an in-class break. Create a separate calming space (with calming tools) in the classroom where the student can take a brief break. b. Leave the class to take a break. One way to do this is to create “break cards” that the student can “spend” when they need to leave class. Provide a fixed number per day (e.g., four cards/day). It’s important that the student learn to use these cards only when they need them. If you have provided them with a reasonable number of break cards and they have used them up, then it may be time for them to go home for the remainder of the day. 9. Create a constructive break space in the school. If the student leaves class, either for a planned break, or an unplanned one, ensure they have an identified and constructive place to go. The goal of the break should be to do what they need to do to return to the classroom. The length of the break should be planned in advance as well. Use a visual timer (e.g., sand timer) to keep track of the time. 10. Provide plenty of praise and special jobs. Oppositional students often gain a “special” status through their challenging behaviour. Seek to change this by regularly praising their positive behaviour, as well as giving them special jobs or other responsibilities where they can feel unique and successful. 11. Be consistent and follow through. Changing behaviour requires maintaining clear and consistent expectations and limits over a period of months (if not years). 12. Spread the attention around. Be careful not to get drawn into providing the student with constant attention. Try to provide regular attention to the student in short, preemptive bursts, rather than waiting for them to demand your time. 13. Deal with unsafe or aggressive behaviour clearly. Some oppositional students may test boundaries further and express their frustration through physical aggression. Distinguish between genuine acts of intentional aggression versus threatened, impulsive, or faux acts of aggression. Ensure that you follow normal school rules when dealing with genuine acts of aggression. 14. Staff must work together. Don’t get divided and conquered. Ensure that all staff respond to the student in the same way. Provocative behaviour can lead to disagreements among staff about how to react. Make sure that everyone stays on the same page and supports one another.